TUESDAY, 12 JANUARY – Universiti Malaysia Sabah (UMS) representative emerged 2nd runner-up in the Women Category at the Inter-Malaysian Universities Folk Song Festival (MAKUM), recently. Puteri Norain Faradina Nordin, a third year student of the Faculty of Humanities, Arts and Heritage (FKSW) UMS took the third spot through her rendition of the song Laksamana Mati Dibunuh and Sireh Pinang. 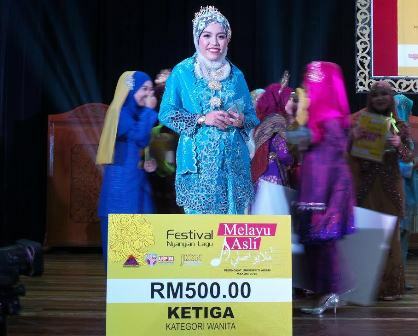 She received RM500 cash, a trophy and certificate. The winner was a representative from University Malaya (UM) bringing home cash prize of RM1,500 whilst representative from Universiti Kebangsaan Malaysia (UKM) was announced the 1st runner-up and received cash prize of RM1,000. They both received a trophy and certificate. As for the Men Category, again UM emerged the winner followed by Universiti Putra Malaysia (UPM) as the runner-up and UiTM third. The same prize was also offered for the Women Category.